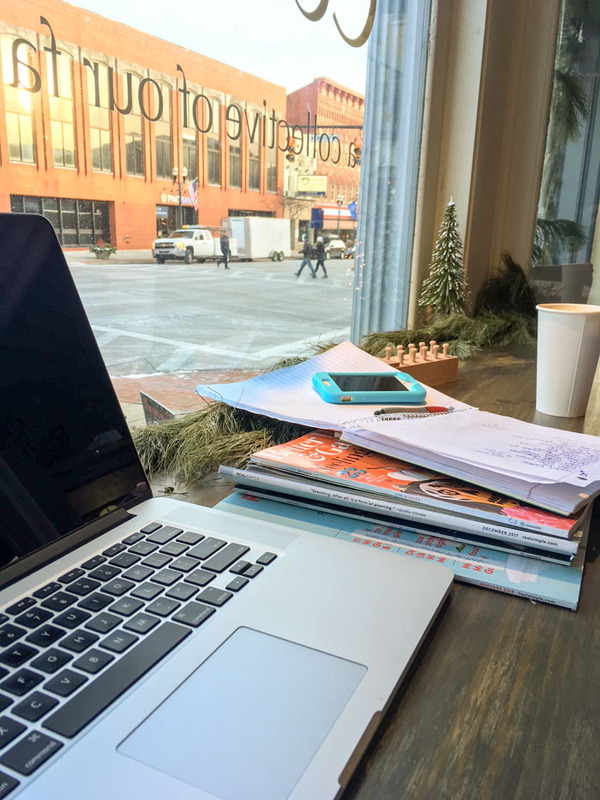 I am writing this month’s update at a new local coffee shop in the large “city” near our home. Good coffee and I’m ecstatic about the speed of their internet. Our home internet is beamed from a silo at our neighbor’s house. Have I ever told you that? 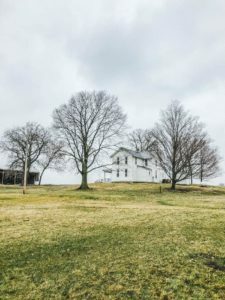 When we bought our home out in the country I knew I was sacrificing quite a few things, one of them being high speed internet. Our internet gets me by, but I’m pumped that I have a new little “home” I can visit when I need a little more umph to my speed. I do like to share things with you all, after all – and it takes internet to get them to you. This month was full of fun moments. 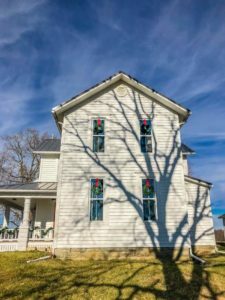 This time last year we had just moved into the farmhouse and so while we truly did enjoy our first Christmas in our home, this year I felt like I wasn’t living out of boxes and we could enjoy our Christmas tree for more than one week. 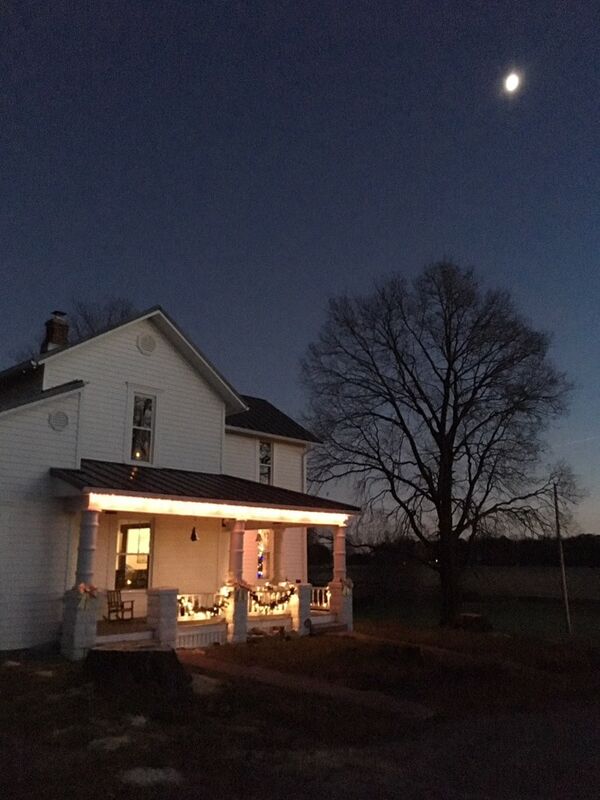 We decorated the outside of our home with lights in our windows and lights on our porch. I plan to do more next year, but I had to wait until this year’s clearance. 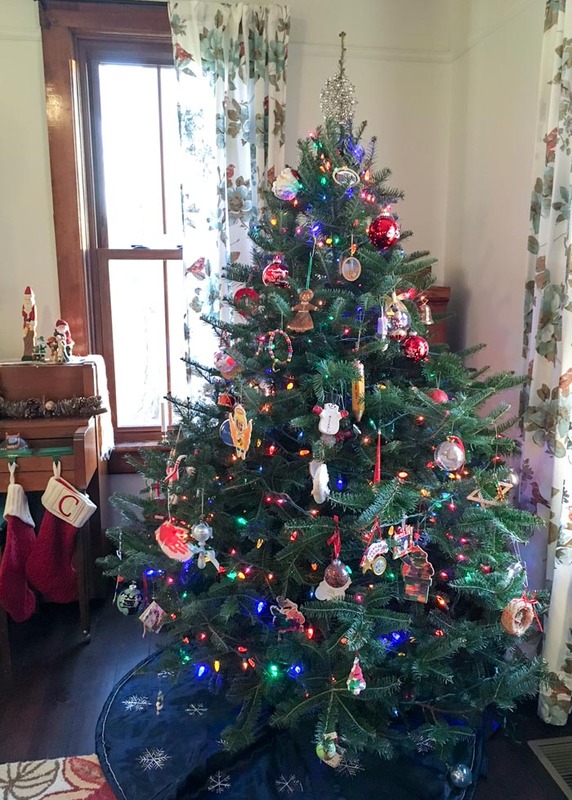 🙂 We again got our tree from a local tree farm that is just a few miles from our home. The gentleman who owns it cuts down our tree and then drives his four wheeler to deliver it to our car. It. Is. Awesome. 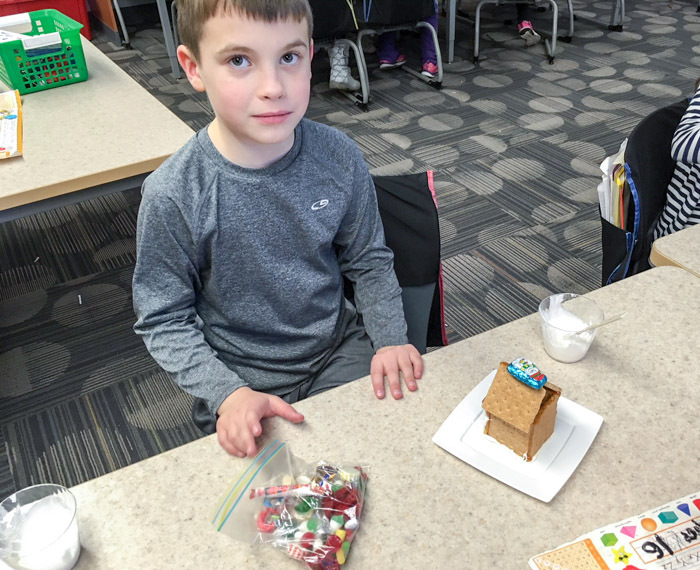 Before Christmas did arrive my mom and I planned gingerbread making for my oldest’s entire class. You can see how excited he was about us being there. 😂 In reality, he loves these kinds of fun activities and we went all out to bring some cheer to his class. You can check out how we made the gingerbread houses here. So easy! We also had a white Christmas this year! The snow was falling when we left the Christmas Eve service at church. 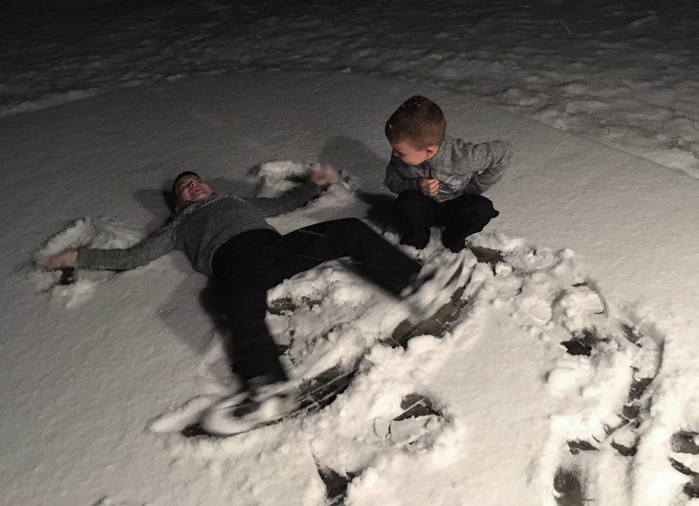 The kids could not wait to get into the snow – and so they did. I at least made them wait until we were just outside our back door. I wanted to get a picture of the house the next morning, but even though we had inches of snow the wind was so strong the next day it had just about blown it all away. All in all we had a wonderful Christmas. 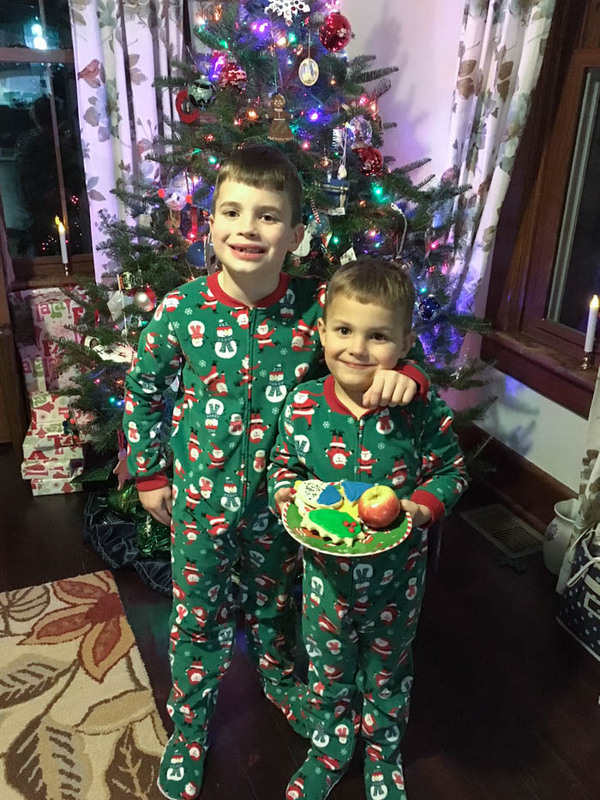 The boys were quite excited to have Santa visit! Not everything was all sunshine and roses this month. Just days after Christmas, our pipes froze in the laundry room. I noticed it when the toilet wouldn’t flush. Then I tried to do a load of laundry and the drain was frozen meaning that all the water that wanted to drain went into the laundry room! Oh, what a sight I must have been wrangling the drain hose trying to stretch it to window outside and then finally figuring out how to unlock the lid on our washer to stop the draining – all while water is pouring out at a speed that was quite amazing. I am very thankful for a brother who came over within the hour while my husband was at work to help us figure out a solution. 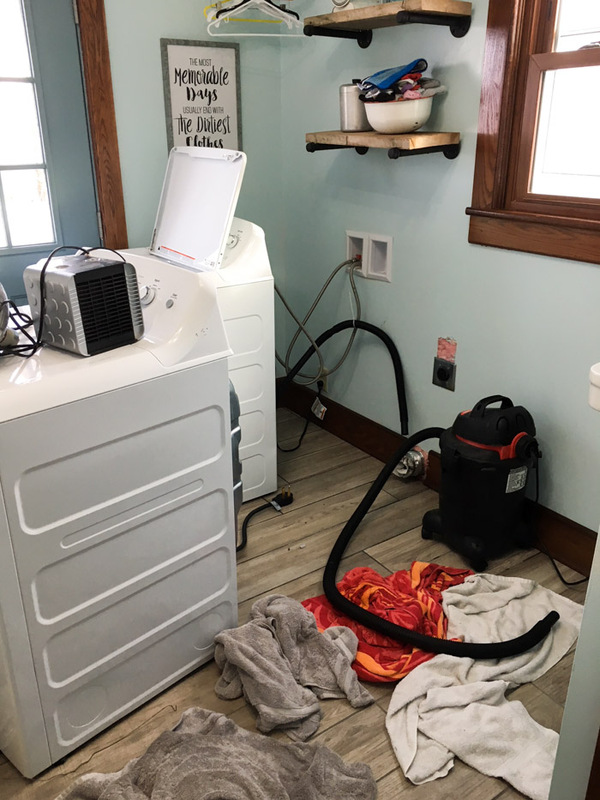 We were able to unfreeze the drain and the cold water to the washer with an access panel he installed. Thankfully, I had a plethora of pictures of our farmhouse renovation so we knew exactly where the pipes are. And I am happy to share that today we got the toilet unfrozen by making it tropical in the little room. It’s been cold! As like many people this time of year, I’m motivated to plan and organize for the new year. 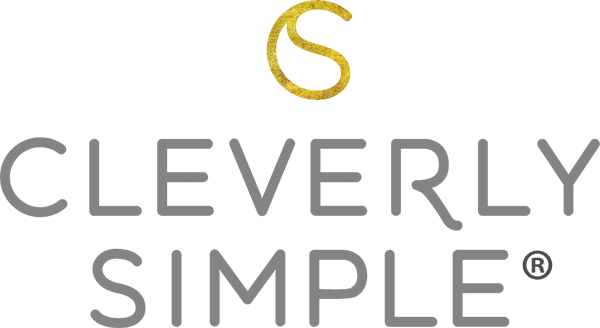 My sister and I had a chance to sit down and plan the next six months of content on Cleverly Simple. I’m very excited to share all that we have in store. 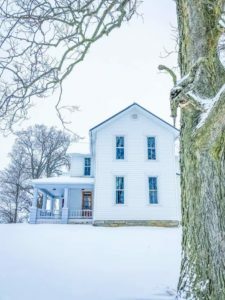 There will be lots of the same delicious desserts, slow cooker meal ideas and DIY at our farmhouse. We’re also planning to add pressure cooker meals to the mix since both of us just recently received one. My sister is also cooking quite a bit of delicious food that is dairy free and egg free because of an allergy in her family so I’m excited to share some allergy friendly meals as well. 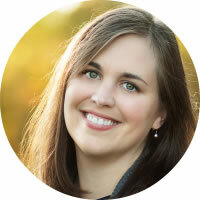 I am so glad I discovered your website; your farmhouse journey has been so helpful and inspiring for me! 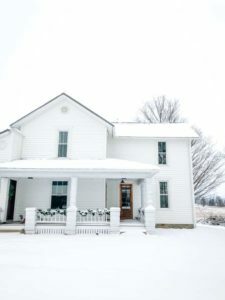 We are in a different stage of life, as new grandparents, but we are considering purchasing and renovating my family’s old homeplace circa 1908! It was sold out of the family almost 3 decades ago,and it has been that long since I have been inside. I have struggled with the life changes this will bring; it means a move and starting over, and I have struggled with balance of original vs new. Thank you for inspiring us! Hi Carol, thanks so much for sharing! Restoring a home like we did is a labor of love but it is worth it. The history my kids enjoy and roots that they deeply experience is such a rarity today. I’m sure your grandkids would also enjoy the home if you do decide to purchase and restore it. The good thing is, a lot of the historic looking details are “in” right now so it makes it a bit easier to make things look new in an old house and still feel relevant to the age of the home. Good luck on your adventure if you choose to proceed. Please keep me posted! Hi from Marilyn in Alberta where we’re sitting at -40 C. I love hearing about your Christmas pre and post. It brought back many memories including frozen pipes. Looking forward to to more. Wishing you a happy prosperous and peaceful New Year. Such an enjoyable post that brought back fond memories. 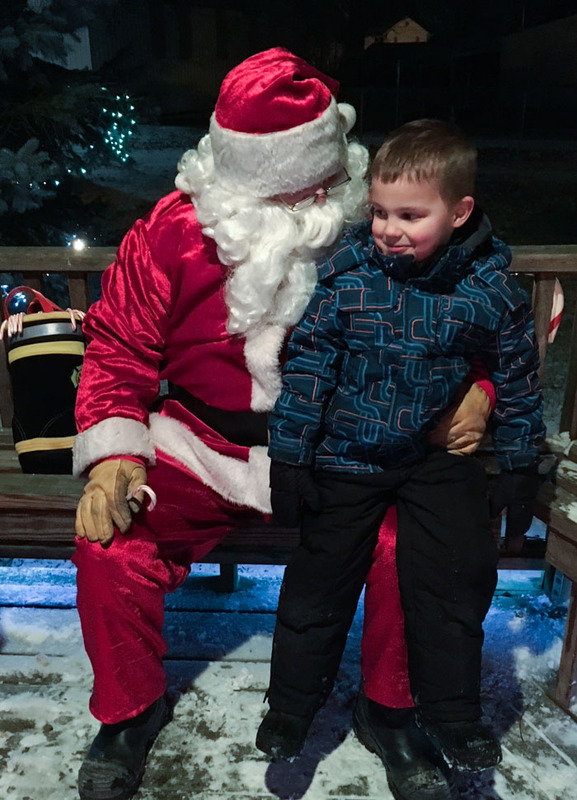 It’s so nice to read that you enjoy the small town Christmas activities and the simpleness of it – it’s the very best. All the best for 2018.